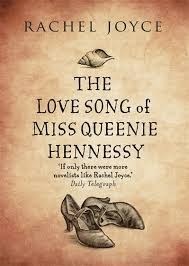 'The Lovesong of Queenie Hennessy', by Rachel Joyce, is the companion book to 'The Unlikely Pilgrimage of Harold Fry', by the same author. 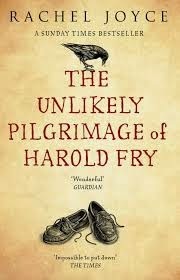 If, like me, you lovingly followed Harold's every step on his journey from one end of the UK to the other, then this is a book for you. We catch-up with Queenie in a hospice for the dying, as she waits for Harold to arrive. The novel is told in her own voice, and is largely consists of her last letter to Harold Fry - her lovesong. In it, she looks back over her time with Harold and re-tells their story, from her point of view, from their very first meeting, in the cafeteria - not the stationery cupboard as he mistakenly recalled. Joyce takes the opportunity to develop the character of Harold's wife, Maureen, and their son David, while introducing a whole band of new characters who reside or work at the hospice, with Queenie. It is in this, that Joyce really shines. As we saw in the previous book, Joyce is masterful in her creation of believable, enchanting characters who converse together about what really matters in life. This ability most probably comes from Joyce's experience as a writer of radio plays. Most of the time, when reading her novels, we feel as if we are eaves dropping on a conversation between people in a room next door. There are many parallels between Harold and Queenie - their odd choice of shoes, for one thing. While he decides to traverse a country in a pair of senseless yachting shoes, Queenie longs for her beautiful red dancing shoes, her most treasured possession. They seem to share a dog too, one who likes to carry stones in his mouth, although, in Queenie's case, the dog is probably a figment of her imagination. The fact that Queenie is not Harold's wife, is a little unsettling - surely it is Maureen who Harold truly loves, or did I mis-read the first book? Aren't we hoping that Harold and Maureen can find each other again and live out happy lives together? One of the greatest things that I remember about the Harold Fry book is that both Maureen and Harold look back over their lives and regret wasting time being mad at one another; they should have loved more and hated less. This new book adds a third wheel to their story and upsets the resolution at the end of the first novel. By bringing Queenie back into the picture, Joyce is eroded that hard-won resolution, for a while at least. But that said, it is lovely to spend some time with Harold Fry again, and I am sure that the author too enjoyed dusting him off and bringing him back into the line light once more. What is delightful about this book, is that while reading Queenie's story, one is actually returning to the previous book, Harold's book. By revisiting the plot, Joyce begins to add layers of meaning to the stories. Each informs the other, creating a richness rarely obtained in this genre. The novel almost insists that the reader returns to the Harold Fry novel, so as to understand this novel all the better, and visa versa, which would encourage the reader to enter into an endless cycle of re-readings that may never end! As the cover suggests, this book is the perfect match for 'The Unlikely Pilgrimage of Harold Fry', and as such, you can't really have one without the other. And as I said in the earlier review of that first book, reading it, was like meeting a new friend, one that will always have a hold of your heart. And likewise, I feel that this introduction to Queenie Hennessy is a revelation; she is every bit as real as Harold, in her quiet, everyday way and just as unforgettable.